Oh my goodness is it hot today. Hope you are keeping cool wherever you are today. As for me I am sitting in my air conditioned living room. I would love to be out and about in the river but alas I have a sinus infection and I am trying really hard to beat it. I am not one that sits and does nothing. It is really driving me crazy, but I will say I have been able to catch up on some movies and cooking shows I had recorded. Hubby will cook burgers on the grill in a bit when he gets home. This Moma is taking it easy today. The laundry and the housework will wait until maybe tomorrow. It is not going anywhere unfortunately. I am a lover of anything lemon, which I am sure you can tell by all the lemon recipes I have posted. My usual go to lemonade recipe just needed a little something extra in it. The more this sits the pinker it becomes from the strawberries, if it lasts that long. My daughter loved this and kept coming back for more. She also loved the fact that she could get it herself by the little spout and so did I. Very refreshing on a really hot day! Make simple syrup by heating the sugar and water in a small saucepan until the sugar is dissolved completely. While the sugar is dissolving, use a juicer to extract the juice from 4 to 6 lemons, enough for one cup of juice. Add the juice and the sugar water to a pitcher. Add 3 to 4 cups of cold water, more or less to the desired strength. Add fresh sliced strawberries. Refrigerate 30 to 40 minutes. 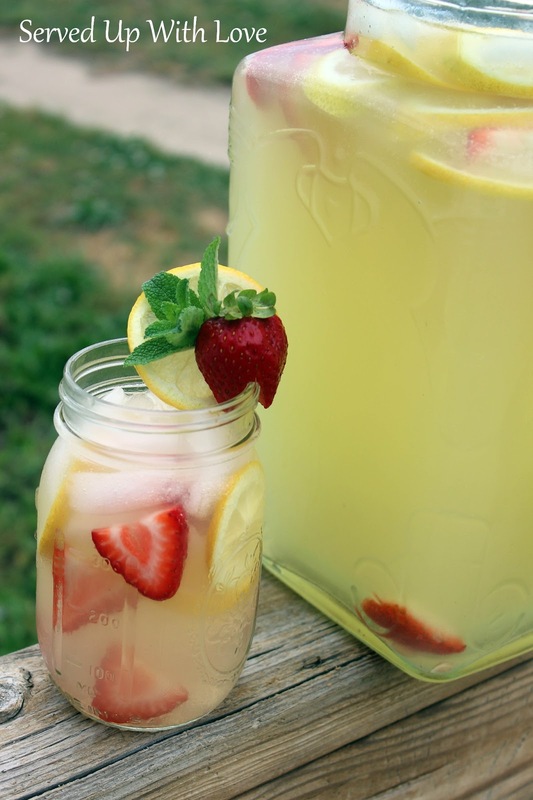 If the lemonade is a little sweet for your taste, add a little more straight lemon juice to it. Serve with ice, sliced lemons, and sliced strawberries. I increased the ingredients to fit my drink dispenser.